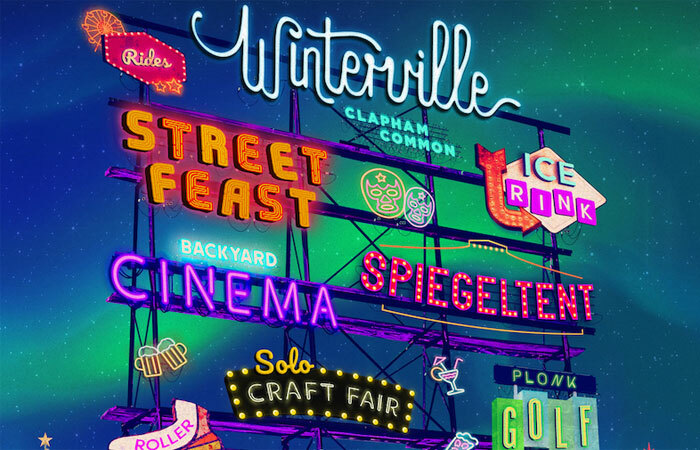 Returning to Clapham Common from November 15th, Winterville is bringing London’s true alternative festive experience once again for five weeks of unmissable fun – with a huge range of street food, drinks and entertainment shaping things up unlike anything else in the capital. This year’s food line-up features some big new names alongside last year’s greatest hits. Expect a new-and-improved Street Feast arena with 10 street food favourites, a further six parking up at Truck Stop plus a pop-up pudding shop, the Chin Chin Café. Across the board, Winterville traders are plotting some unbeatable comfort food for this year’s menu. Get ready for globe-spanning street food specials with a festive twist: Up In My Grill’s fondue steak sandwiches with juicy Bavette steak, confit onion, cheese fondue, garlic butter and bone marrow gravy, INK’s spiced Christmas fish nuggets with sweet chilli and ginger dip, Raclette Brothers’ plates of molten Raclette cheese with roasted potatoes, pickles and pancetta, Born & Raised’s sourdough pizza topped with stilton, butternut squash, sage and roast walnut and much more. Sweet treats also reign supreme. Go to Chin Chin Labs’ new mad-cap cafe for DIY s’mores – giant home-made marshmallows on sticks for you to roast over the fire pits yourself, served with biscuit crumble and gooey chocolate sauce. There’s also crispy Churros with Belgian chocolate dipping sauce from Love Churros and a hot and fresh doughnut bar from You Doughnut. Winterville’s winter watering holes will be serving everything from Boozy Hot Chocolate to spiced Hot Wine. Start with a craft beer at Brew Camp, grab a Frozen Toffee Vodka from one of our Happy Cabins, then finish inside Winterville’s cosy pop-up pub, Bar Humbug, for killer cocktails and plenty of late-night entertainment. Packed to the rafters with incredible free nights for the diary, Winterville is undoubtably the home of festive fun. Kicking off festivities in true style, Winterville will play host to the wildest opening weekend the pop-up town has ever seen. The one and only Melanie C AKA the iconic Sporty Spice will start the party by taking to the Spiegeltent decks for a trip down memory lane with an extra special 90s Mixtape DJ set. Elsewhere over the weekend, big ballad supremos Ultimate Power are shaping up to bring the ultimate sing-a-long session to the Common, while the Two Brewers Takeover are primed and ready to get the masses grooving with London Gay Big Band who are set to stamp out those November blues. Every Friday and Saturday night, the fun continues – with the likes of the godfather of club culture Norman Jay MBE, founding father of Soul II Soul Jazzie B, party starters The Cuban Brothers, selector extraordinaire DJ Yoda, and London’s favourite funk soul & disco spinners South London Soul Train, plus many more resident DJs still to be announced. London’s top club nights sit pride of place for special Winterville spectaculars, with pop heavyweights Guilty Pleasures and the UK’s longest running party Bugged Out providing dancefloor fillers every weekend. Sing-a-long dons Massaoke will be at the reigns every Thursday, and Karaoke Hole on Saturdays, for all your crooning needs, while eyes will be down for Indeedy Musical Bingo who will pop in for a Saturday night one-off special. Previous London Shuffle launch their ‘Winter in S’moreditch’ Terrace with fire pits and home toasted campfire treats.